We are able to order this watercolor palette for you. Our shipments usually arrive on Tuesdays and Thursdays around 11:00am if it is in stock with our supplier. 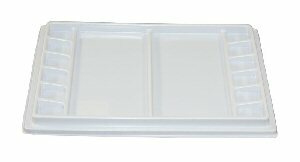 The watercolor palette insert is an accessory for the Sienna Plein Air Pochade Box. Two sizes of palette are available to match the two sizes of Pochade Box. Two rows of well line each side of the palette. There are two large mixing wells to keep warm and cool colors separate. A lid is included to cover unused paint. The watercolor palette is held in place with the large set of palette blocks included with the Pochade Box. The L palette has six 1” x 1” wells on each side of the palette.